Habit at Pukalani, Maui, Hawaii, (USA). April 17, 2009.Flowers at Pukalani, Maui. April 17, 2009. Origin and Habitat: Bulbine frutescens is a species of flowering plant in the genus Bulbine (Family: Asphodelaceae), native to southern Africa (occurs widespread throughout parts of Northern Cape, Western and Eastern Cape; however, it reaches its peak in the succulent-rich, dry valleys of Eastern Cape. ), Lesotho and Swaziland. Its distribution in Namibia is only around Fish River Canyon and the extreme southern regions of the Namib Desert. Habitat and ecology: Dry, sandy or rocky areas, usually with substandard soil. Succulent Karoo, Nama-karoo, fynbos, grassland and bushveld-savvana. The brightly coloured flowers attract luring bees and butterflies to feed. Bulbine caulescens L. ex Steud. Description: The "stalked bulbine", Bulbine frutescens, is a fast growing, succulent, evergreen perennial groundcover, with linear green leaves similar to onion leaf blades in opposite rows and clasping the stems at the base. 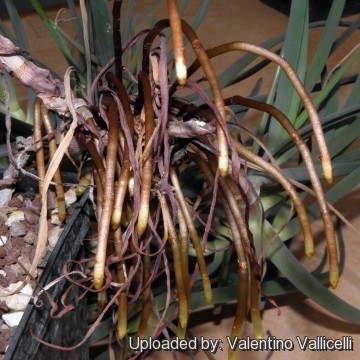 It forms spreading clumps with greyish stems often bearing adventitious roots. The small 6-petaled yellow star shaped flowers with fluffy yellow stamens are carried on an upright, spreading raceme during spring (or occasionally at other times). The petals are either yellow or sometimes orange, which combines attractively with the fluffy yellow stamens to give a bi-coloured look. 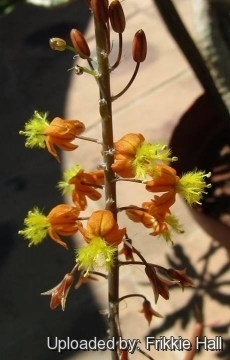 The yellow-flowered form is most common, but there are at least two different shades of apricot in cultivation, one of which is known as 'Hallmark'. 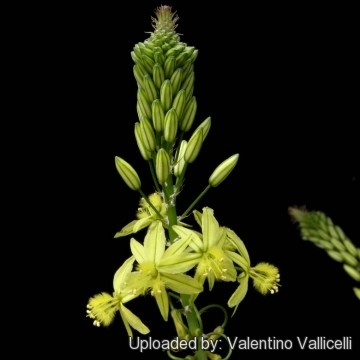 Bulbine comes from the Greek word bolbine, a general word for a bulbous plant, but the name is misleading, as plants do not have any bulbous base nor tuberous rootstock. Stems: Shrubby erect to prostrate, winding, woody, branched 6-8 mm in diameter, that roots as it touches the ground allowing the plant to cover an area of 60-90 cm in diameter, branched, with the lower leaves 12-25 mm apart, the upper crowded. Leaves: Long, thin, succulent 8–12, distichous, subterete, bright green to green-grey, very variable in length (usually 15-25 cm long) in the cultivated plant, 6 mm in diameter, flat in the lower part of the face, turgid in the upper part, semicircular on the back. Inflorescence: Peduncle simple held 30-90 cm above the foliage. raceme 15-30 cm long, an 2,5 cm in diameter; lower pedicels 12 mm long very much incurved, bracts small, deltoid-cuspidate, fimbriate at the enlarged base. Flowers: Perianth bright yellow or sometime orange, 8 mm long. 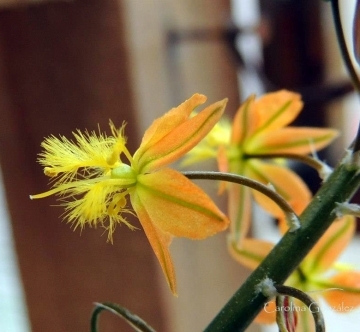 Will notice the anthers are fringed in yellow, looking like small caterpillars inside the petals. Flowers open (and close) progressively from the bottom of the spike upwards. Blooming season: Spring through summer, occasionally in other period of year depending on growing conditions. The long flowering stalk opens slowly, with a few star-shaped flowers at first, then more and more as the season continues. Fruit (capsule): Globose, the size of a pea. Seeds: 3–4 in a cell. Black dispersed by wind. 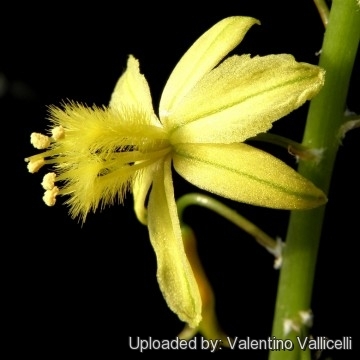 1) Forest & Kim Starr “Bulbine frutescens (Stalked bulbine)”. Plants of Hawaii. <http://www.starrenvironmental.com>. Web. 3 feb. 2015. 3) Wikipedia contributors. "Bulbine frutescens." Wikipedia, The Free Encyclopedia. Wikipedia, The Free Encyclopedia, 24 Sep. 2014. Web. 4 Feb. 2015. 6) Dyson, A. “Discovering indigenous healing plants of the herb and fragrance gardens at Kirstenbosch National Botanical Garden.” NBI, Cape Town. 1998. 7) Joffe, P. “The gardener's guide to South African plants.” Table Mountain Publishers, Cape Town.1993. 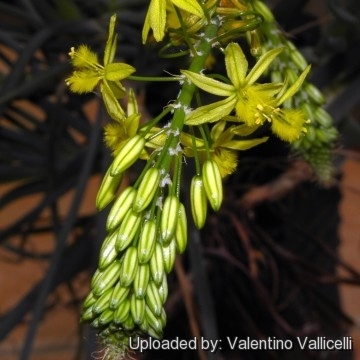 8) Shireen Harris, Free State National Botanical Garden December 2003 “Bulbine frutescens (L.) Willd” in: Plantzafrica <http://www.plantzafrica.com> Web. 3 feb. 2015. 13) Malcolm Dee Hepplewhite & Witkoppen. Wildflower Nursery, Text and Photographs, 2013. 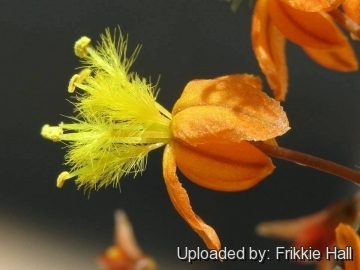 “Bulbine frutescens” <http://witkoppenwildflower.co.za> Web. 3 feb. 2015. Cultivation and Propagation: Bulbine frutescens is a popular, waterwise garden plant, especially when planted en masse as a ground cover, or in rock gardens. It is also cultivated for its medicinal properties. It is mostly dormant in summer, blooming in the spring, and then again in autumn although somewhat less. Soil: For best results it should be planted in well-drained soil preferably enriched with compost. Fertilization: Feed with a mulch of compost. Moisture requirements: Plants are drought resistant, requiring very little water, but respond well to fairly regular watering. Exposure: These plants prefer full sun, but they will also grow in semi-shade for part of the day. 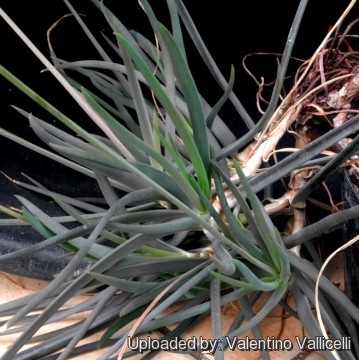 Although it will grow indoors, it requires maximum light. Hardiness: This species is frost hardy. 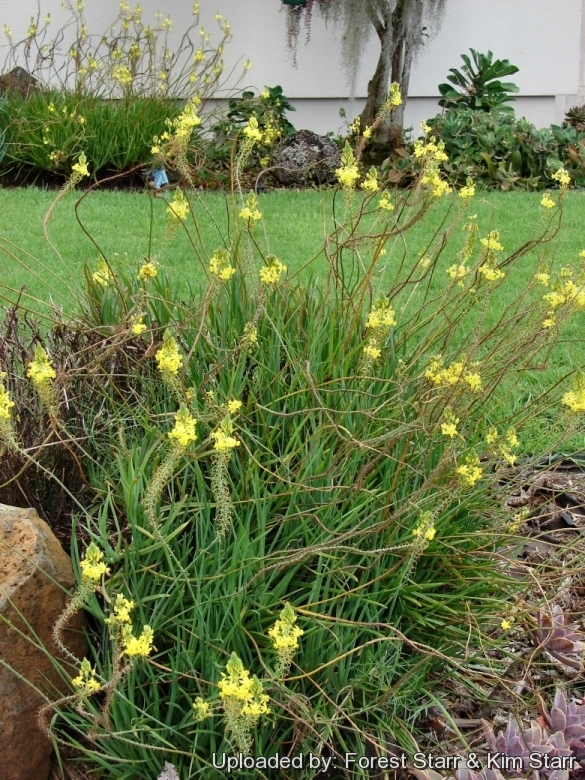 Garden uses: Bulbine frutescens is often used in landscaping where a drought-resistant, tough groundcover is required. It also has its value in the home garden. It combines beautifully with blue dwarf agapanthus, flowering at the same time. Maintenance: Prune it when untidy. Remove the old flower heads to encourage more flowering and to keep plants neat. Medicinal uses: The gel or sap from leaves is a traditionally remedy for mosquito bites and to heal cuts, burns, rashes, cracked lips, acne, cold sores, mouth ulcers, areas of cracked skin and eczema. This plant is ideal to grow and is a useful first-aid remedy for childrens' daily knocks and scrapes. The Rastafarians make an infusion of a few fresh leaves in a cup of boiling water. The strained drink is taken for coughs, colds and arthritis. Propagation: It can be propagated easily by stem cuttings, or either seed and division of clumps. The cuttings can be planted immediately and kept in a shady area. They do not need any special attention or treatment, and build strong roots in a couple of months. Once the seedlings have four leaves and the cuttings have a well-formed root system, they can be transplanted. Bulbine self-sows freely, so unwanted seedlings might appear.